Today’s trail-work was concentrated on the Pine Run Cabin Area Trails. Two of the classic cabins are open in the winter months. Consequently, I have noticed that the robust folks who rent these cabins, at this time of year, are often hikers. Subsequently, those staying in this area have access to a great number of trails without having to drive anywhere. Pine Run, Honeymoon, and TM Cheek trails all have trail-heads in the Pine Run Cabin Area. These trails also junction with trails that lead towards the Beaver Creek area, TM Cheek Overlook and the trails around Watoga Lake. An old blaze on an oak tree on the Allegheny Trail – one that opens up the tree to damaging insects and fungus. Today a single yellow blaze marks the length of the Allegheny Trail, which I am sure the trees appreciate. So today we cleaned up the Allegheny Trail to Honeymoon Trail. 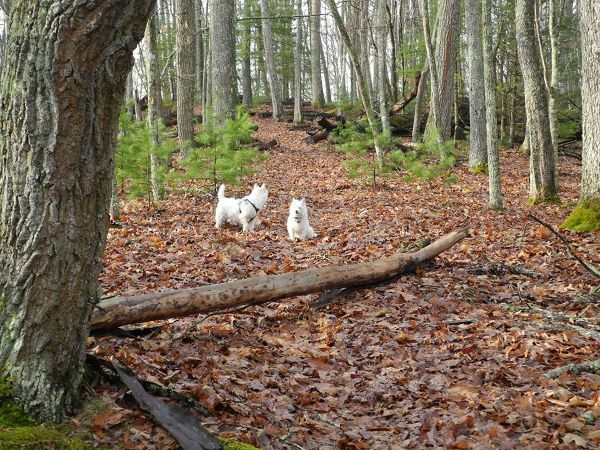 Meanwhile, after traipsing through the cabin area, continued clearing the Recreation and Laurel Trails. There are several trees down on these sections of trail. They will be cut with a chainsaw in the near future. I find winter hiking to be enjoyable and possessing a beauty of its own. The lack of canopy opens up views that are hidden in the warmer months. As well, fewer people are on the trails so there is a greater sense of solitude. Plus, when water transitions from liquid to solid, the keen eye spots unique and ephemeral sculptures that may very well be seen by “your eyes only.” Something created just for you ! And you can’t beat that. 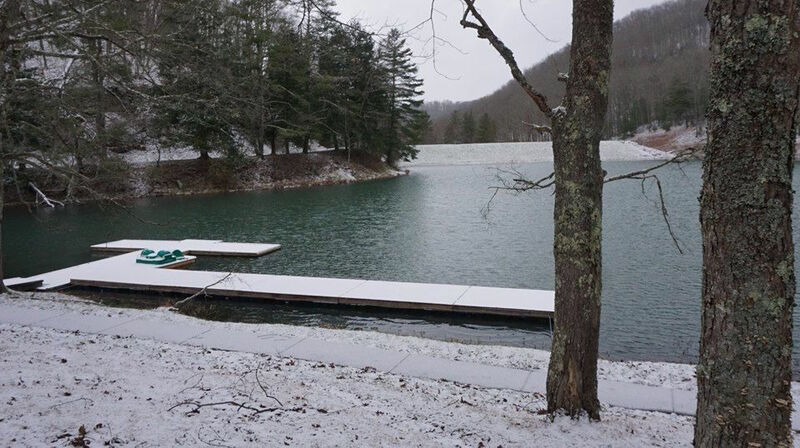 A light snow on the banks and dock of Watoga Lake. Soon the lake will freeze bringing joy to the ice fisherman who return every year like the swallows to Capistrano. 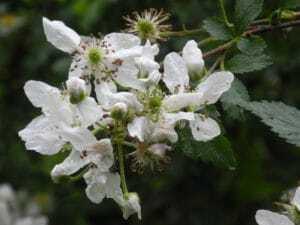 Watoga Trail Report June 28, 2018 Update. It felt wonderful to get back out Watoga’s trails. This morning ended a month- long convalescence from rib fractures sustained on the Bear Pen Loop. My dog Bongo felt it would be a good idea to go right back out on the same trail. Sort of a “get back in the saddle” suggestion. And, as usual, he was spot on. We cleaned all but 2 trees that will require another visit with rope and pulleys. First Chanterelle of the Season! 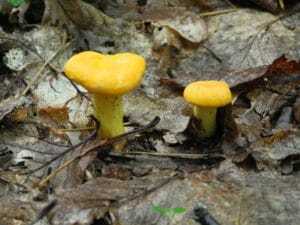 Whilst working the Bear Pen Loop I found my first Chanterelle of the season up on the North Boundary Trail, and as a bonus came upon this trio of Quilted Russulas just a few yards on down the trail. 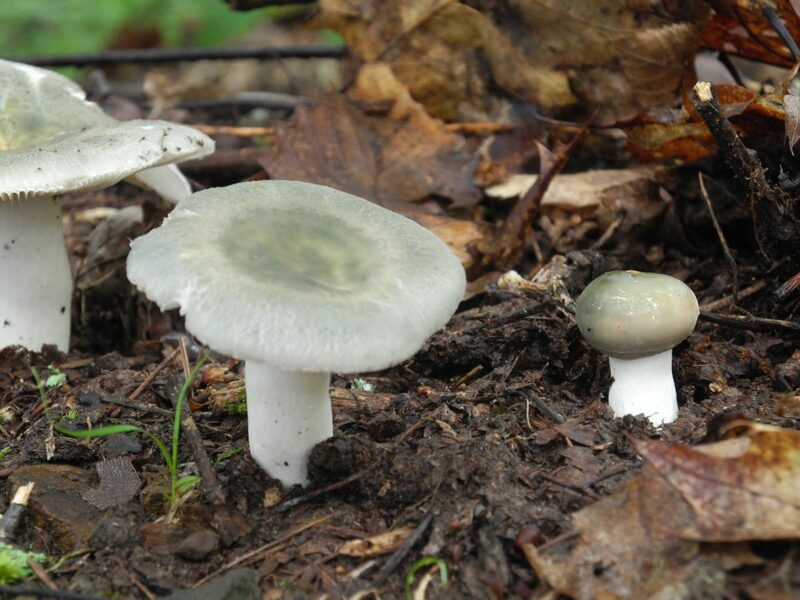 Both of these species of mushrooms are about as flavorful a wild treat as one can find here in the Appalachians. These delicacies are destined for a dish called a Spanish Tortilla, which has nothing to do with the flat corn Mexican tortilla associated with tacos. Instead, the Spanish tortilla is an egg, potato, cheese and mushroom dish cooked in a cast iron skillet. Don’t forget the wine Laura and Margot. Yesterday in another part of the park Mark Mengele was transporting a work crew consisting of David Elliott, Ken Hiser and his friend Matt out the Ann Bailey Trail in Mark’s restored Dodge Power Wagon (sorry no pictures yet, hint, hint) to the Workman Cabin. They spent the morning hours weed-eating the area around the cabin, and removing the large tree that had fallen across Rock Run in front of the cabin. David remarked that they “left a tidy mountain homestead for visiting hikers to enjoy”. And that reminds me; we need to get down at the other end of Rock Run and clean up those nasty stinging nettles. Pity the poor hiker that heads up Jesse’s Cove with shorts on. Finally, I ran into Mac Gray this morning on the entrance road involved in a worthy project: He is photographing all of Watoga’s cabins, inside and out. He is always thinking about something called “posterity”. Well that’s the news from Lake Wobeg…., Whoops, I mean Watoga State Park. “I finally got some spare time and the weather cooperated. So I spent Friday and most of Saturday doing some trail maintenance and cleanup projects in and around Watoga. Started out Friday morning clearing fallen trees from the landing strip at Beaver Creek. Then moved onto the Allegheny Trail. I removed fallen fallen trees on the mile and a half stretch of trail parallel to Chicken House Run Road. Yesterday I was at Laurel Run campground. A couple of pine trees had fallen on campsite #9 sometime over the winter. I removed them and moved the slash out of the away of the campsite. After that went up I went up Kennison Run trail from the campground a mile with lopper’s cutting out saplings and undergrowth along the trail. Some of the creek crossings were a little tough to manage from recent heavy rains. A lot of debris had washed down and stream banks had eroded. Trail’s that follow creeks I guess have an ever changing landscape. There wasn’t any fallen trees to deal with as far as I got before deciding to turning back as a thunderstorm approached in the distance. Mark Mengele is continuing efforts to conduct a bird survey of the Rock Run watershed at Watoga State Park, also known as the Old Growth Area. The plan is to get experienced birders out there at various times of the year, and over the next couple of weeks they will be surveying breeding birds. While the birds are breeding the plants and trees of Watoga are pursuing their single-minded agenda of reproduction. Fertility and distribution are a top priority for plant life at this time of the year. 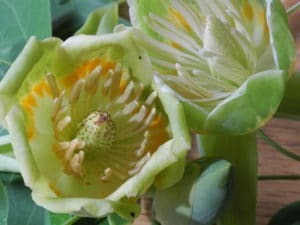 With that in mind today’s photographs take a close look at several prominent blooms with an unabashed look at their reproductive parts. 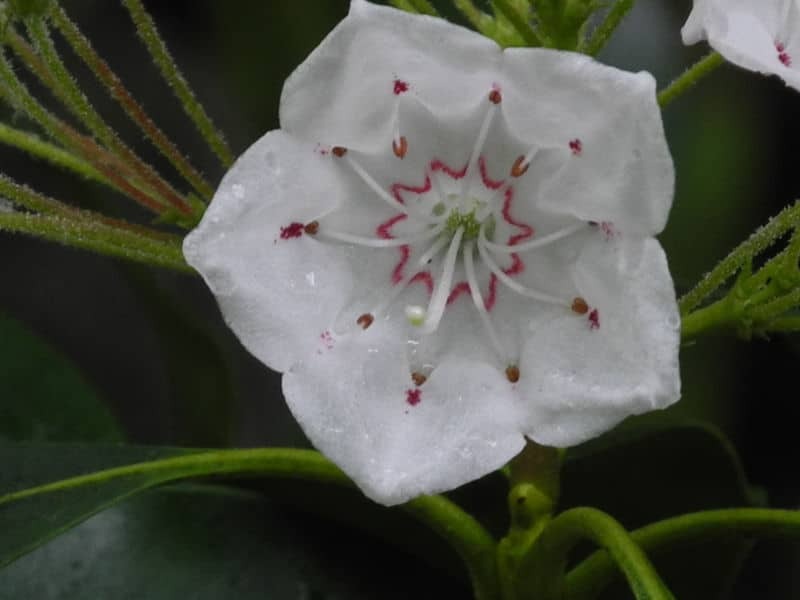 The ephemeral mountain laurel bloom so petite and beautiful looks like a hand painted porcelain miniature. 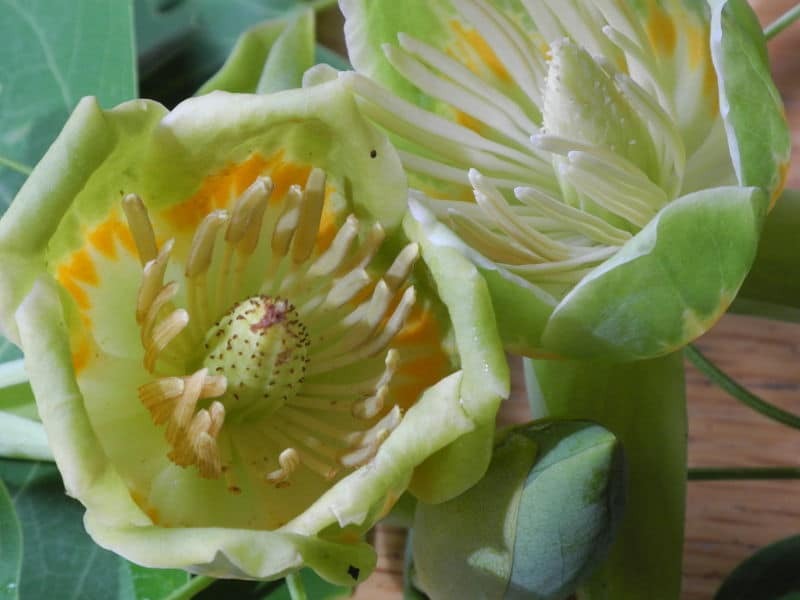 The bloom of the tulip poplar is usually viewed high up in the tree, but this time brought down by wind and rain for a closer look. Hiking allows us the opportunity to stop and take in the finer details of nature. There is not a better way to “be in the moment” than a hike in the woods. For the last 21 years visitors to Watoga State Park have driven by Jack Horner’s Corner as they make their way through the village of Seebert, the gateway to the park and a major trailhead on the Greenbrier River Trail. Longtime visitors have observed the steady growth of the building and parking areas; the old building removed, decks added for dining with a view of the river and bike path. Horner’s Corner is strikingly colorful with stacks of kayaks, floatation devices and bicycles. Stewart and Chrissie are at the helm of this growth, anticipating the needs of the community and the thousands of visitors who stop by every season, which for Horner’s corner is sometime in April until November. This large, well designed building houses a pizza and sub parlor, a huge array of souvenirs touting Watoga State Park and the Greenbrier River Trail as well as basic groceries and drinks. You can stop in to rent a kayak for a river trip on the Greenbrier River and arrange a shuttle. The same service is offered for those wishing to ride a bike on the 80 mile Greenbrier River Trail. Their ice cream cones have become legendary; I have never been in there in the summer months without a queue waiting for a cool treat. One chap who wanted to remain anonymous told me he cannot go past the place without getting an ice cream cone. OK you have twisted my arm; it is Mac Gray. Mac lives just a few doors down so that amounts to a heck of a lot of ice cream. Sorry Mac, I am terrible at keeping my sources confidential. 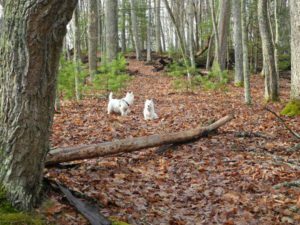 Consider the trails currently existing in Watoga State Park. Some of these are assumed from existing pioneer trails. And those early but historical trails may have been appropriated from trails trod by the ancients. We now call them Native Americans. After all, the terrain forces us to take the path of least resistance. So it is reasonable to assume that there is a certain logic to the path one takes to get from one place to another. Trails were important to ancient people for hunting, trade, socializing and annual migrations. So I was not surprised when I found an arrowhead on Monongaseneka Trail recently. Finding an arrowhead is a singularly profound experience. Consider the last human to touch it was an Indian who lived and hunted in these mountains hundreds, if not thousands, of years ago. So, what can we infer about this person by the artifact that he left behind? We may be able to determine an approximation of the age of the point by the material it is made of and its design. This point is a stemmed point referring to the square elongation at its base. 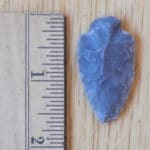 The color and quality of the flint suggest it may have come from flint found in the Lewisburg area. And finally the design indicates it may be Archaic, a group of Native Americans who lived in settlements in our area in the period from 9000 BC to 4500 BC. An archaeologist or a collector may have more accurate information. But it is probably not a tool that belonged to historic native groups, such as Shawnee. Is it truly an arrowhead ? Was it attached to an arrow shaft and shot from a bow? Probably not. Only a small percentage of flint points were used on arrows. Furthermore, it was not until about 1400 years ago when the bow and arrow found its way to the western hemisphere. 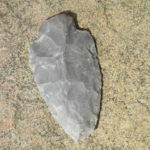 Flint points were manufactured for a variety of uses including scrapers, knives, bow drills for making fires and drilling holes, and for spears. This point may have been a spear point, meaning it is attached to a wooden shaft and cast using a spear thrower called an atlatl. This fine point is on display at the Watoga Nature Center. It is a reminder of the people of many purposes, languages and customs who traversed these same mountain trails that we do to this very day. It goes without saying that the removal of any historic or prehistoric artifact in any West Virginia State Park is unlawful and deprives the public of its cultural value. 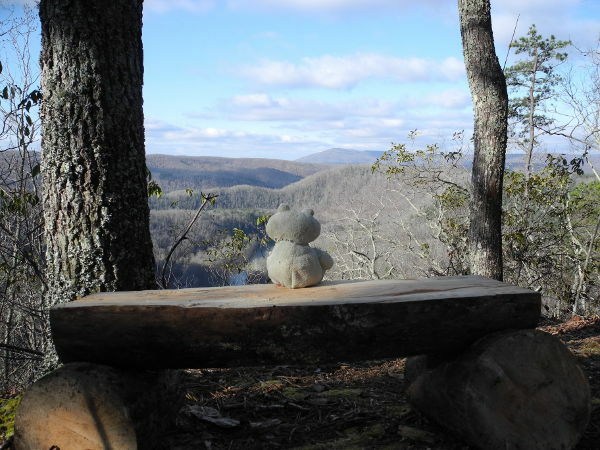 Have you ever ventured out on Monongaseneka Trail here at Watoga State Park? I highly recommend it. The trailhead is located a mere 1/2 mile up the main park entrance road. Just after crossing the newly restored bridge across Isle Lick you will see the parking area on the right, with the start of the trail across the road and on your left. This 2 1/2 mile trail follows switchbacks up the mountain, drops down into Jeff’s Hollow before ascending again to the main ridge high above Seebert and the Greenbrier River. From here you can hike the Overlook Loop out to the overlook where you can sit a spell on the benches before resuming your hike out to the North Boundary Trail. The are several ways you can make this a longer day hike by shuttling a car to Bear Pen Trail or the parking area at the picnic shelter. My favorite way of hiking this trail is to leave a bicycle at the park headquarters, then drive down to the Mongaseneka trailhead and leave your car there. Hike up Monongaseneka to North Boundary Trail, Down Bear Pen Trail all the way to Watoga Lake. From here you can hike the Lake Trail either direction until arriving at the park headquarters. Now this is where the fun begins: you have just completed a long and beautiful hike and now you get on your bicycle and coast down the main entrance road back to your car. The whole while Isle Lick is noisily alternating from one side of the road to the other; a series of cascades and pools. It doesn’t get any better than that. I spent a couple days up on Monongaseneka trimming striped maple and removing smaller debris off the trail. I couldn’t pass up the opportunity to use the new benches at the Monongaseneka Overlook, courtesy of John Casto and crew. A selfie is something I am not inclined to do, in large part because I do not want to mar the great scenery. So instead I borrowed Mr. Frog from one of my dogs and created a “frog’s eye view ” from the overlook. The largish double-trunk tree can be found in Jeff’s Hollow along with many others of similar size. There is a palpable sense of entering a special place here which can only be felt by being here; it is hard to translate the feeling with mere words. Some places just seem to be sacred; when there we are quite sure that there is a spiritual dimension to the deep wood. And for a while we carry that feeling with us until it beckons us back again. 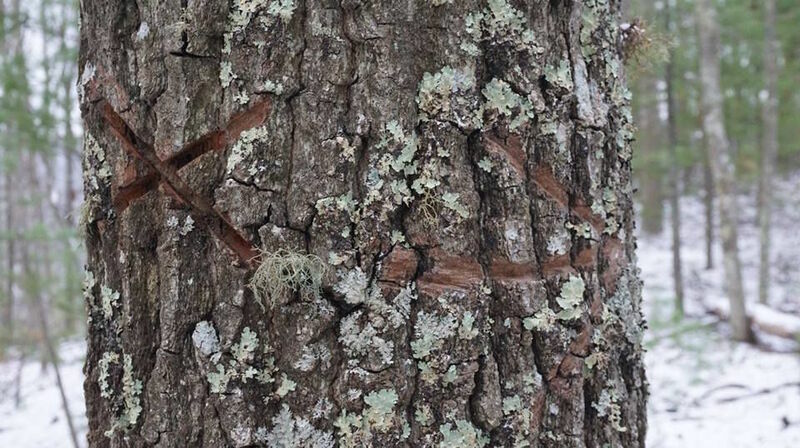 Ancient Petroglyphs found In Watoga State Park? No, these are the feeding trails of the Emerald Ash Borer. 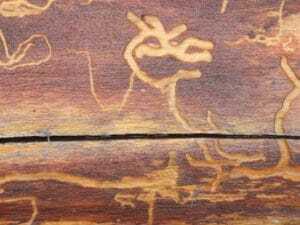 In this case the Emerald Ash Borer is responsible for perpetrating a trick on the human brain, pareidolia. We humans instinctively seek patterns in nearly everything we see. For example, I see an abstract horned creature in one photograph and a coyote in the other. The sad truth is that the ash tree is being decimated by the Emerald Ash Borer at a rate not seen in any one species of tree since the Chestnut Blight of the early 1900s. The white ash is considered “critically endangered” and the population decline is expected to be 80% over the next 100 years. As one forester wryly put it ” Without divine intervention we can kiss our ashes goodbye”. 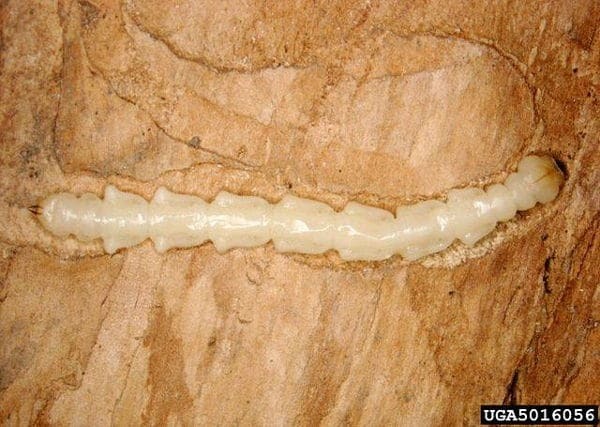 When the Emerald Ash Borer enters the tree it lays eggs. The emerging larvae attack the phloem essentially girdling the tree. They attack trees as small as 2.5 cm in diameter, long before it is mature enough to produce viable seed. This virtually ensures 100% mortality of the species. 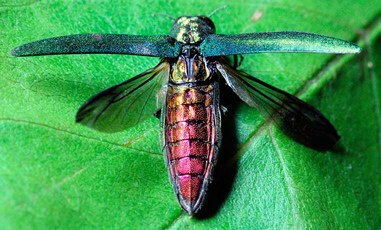 Emerald Ash Borer Critically Endangers Ash Trees. White ash is valued for its strength and straight grain. It is used for everything from furniture to tennis rackets and baseball bats. I have an old pair of snowshoes that hang on my wall. They are made of ash. We will miss this tree just as we miss the chestnut, the elm and all the other species that have been the victims of parasitic attack. In ways we are not now aware of we will sorely miss all of the wild things that go the way of the passenger pigeon. When the last ash tree is gone, we will be all the poorer for it. With that in mind I leave you with a poem that speaks to the love, utility and admiration of the Ash tree. If for logs ’tis laid away. Hawthorn bakes the sweetest bread. a king shall warm his slippers by. 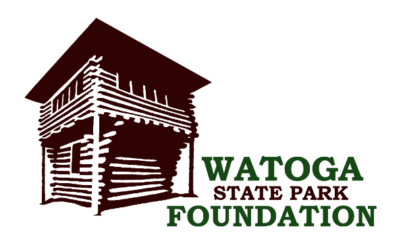 Watoga State Park has a new distinction. It was made official yesterday when Park Superintendent Jody Spencer received a plaque giving Watoga State Park an Old Growth Forest designation. Dr. Joan Maloof, Director of the Old-Growth Forest Network, made the presentation yesterday at the Ann Bailey Trailhead. Now Watoga is part of the Old Growth Forest Network. Dr. Maloof spoke to an assembled group of local park advocates about the need to protect the old growth forests for future generations. She stated that old growth is a diminishing resource making up less than one percent of our eastern forests. Dr. Maloof emphasized the importance of introducing young people to the beauty and unique characteristics of old growth forests. Consequently, they will continue to protect these areas for many generations to come. Following the presentation the group went on a guided hike to view a portion of Watoga’s old growth area. 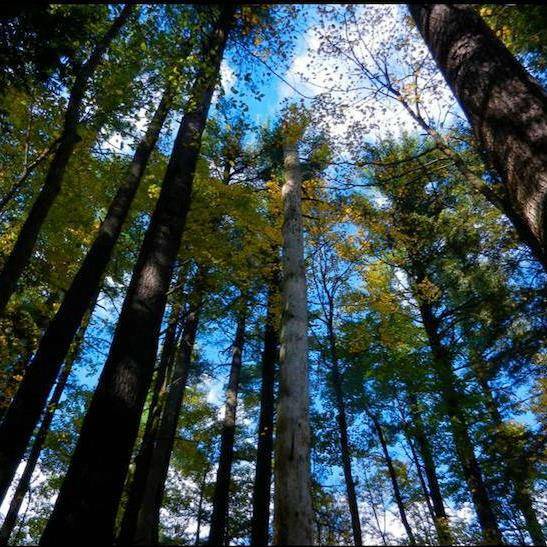 Watoga State Park is fortunate to have existing trails that are in close proximity to the large trees so that visitors to the park will have the opportunity to see their natural heritage up close. We always knew that Watoga State Park is a very special place, and now it is even more so. Joan Maloof, Professor Emeritus at Salisbury University, founded the Old-Growth Forest Network to preserve, protect and promote the country’s few remaining stands of old-growth forest. I am not opposed to harvesting trees for board and fiber, but as an ecologist I know that when we do we are sacrificing biodiversity. What I came to realize is that we are also sacrificing beauty. A certain amount of sacrifice may be necessary – all animals influence their surroundings – but there should also be places left to nature’s processes, if only so we may witness how nature works; if only so we may enjoy the beauty and the wonder of such places. It is these left-alone places that are refuges for birds, and butterflies, and animals of all kinds. We humans depend on them to clean our air and water and protect our climate. I am told the riding operation was run by Stuart Horner’s father. 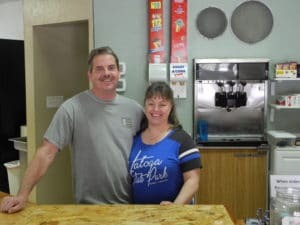 Stuart and his wife Kristy currently run the iconic Horner’s Corner, a familiar sight to visitors as they pass through the village of Seebert en-route to Watoga. It has also been confirmed that the high cost of liability insurance finally brought this popular activity to a close. The horse trails have been resurrected as the Busch Settlement and The Bonnie Trails and are now serving the public as wonderful hiking trails. Well, we still have our memories of things that are no more, and here are yours. “ I do have a Watoga horseback riding story. My husband and I spent our week long honeymoon in a cabin at Watoga. I am the “horse person” between us two, but talked him into doing the “one hour” trail ride one day. A couple days later, I wanted to go again, but he wasn’t quite as interested. When we got to the stables, we were still discussing it, and the 2 men that worked the stables then overheard us. They knew from our first ride that I was an experienced rider, and said that they hadn’t been on the “two hour” trail yet that early in the year (it was May) and if I wanted to go, they’d charge me less, since some clearing of the trail, or going around downed trees might be involved. “In the 1950’s horseback riding was very popular. The first summer (1956) I worked at Watoga there was a very bad accident. A couple on their honeymoon was riding and the horse the man was spooked by a snake and threw the man. The fall broke his back, we never heard if he was able to walk again. 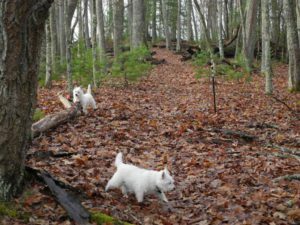 Bongo, Daisy and their manservant left their collective tracks in the snow this morning as they ascended the NW section of Honey Bee Trail. The recent winds have dropped many trees and branches on Watoga’s trails but we managed to clear all on this part of Honey Bee Trail save a 14 inch oak lying flush with the trail about 1 1/4 miles from the trailhead. Old Growth. Now that the existence of old growth trees in Watoga State Park has been confirmed I find myself constantly looking for the large trees. The largest oak spotted today in the Arboretum was well under 30 inches in diameter and the average was probably in the 12 inch range. Grand trees for sure, but the ones in the old growth area have a century or two head start on these youngsters. If I were to tell you that Bongo and Daisy dragged this downed tree off the trail, you may not believe me. Therefore I will take the credit for it and give them a treat as recompense.